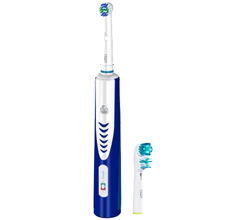 Oral-B Toothbrush, Rechargeable, Professional Care 7400, Avi Depot=Much More Value For Your Money! provides dentist-inspired cupping action in which a unique, round brush head surrounds each tooth for a tooth-by-tooth clean. The combination of high-speed pulsations and the oscillating rotating technology has been shown to reduce plaque and gingivitis more effectively than a regular manual toothbrush.